The only novel I’ve read before that is even remotely like Tree of Smoke is William T. Vollman’s Europe Central, another sprawling, messy book from another messy, inscrutable writer. It also won the National Book Award (let’s take a second to commend the forces-that-be of that particular literary institution for rewarding such brave, genius, and criminally under-read novels). 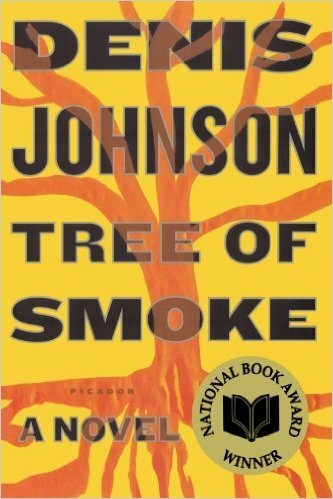 That book came out in 2005, Tree of Smoke came out in 2007, and it’s now been almost a decade since we’ve seen anything like either one of them. Johnson’s novel has a lot of heart, deployed in a lot of different ways, and, like the heart, what it achieves is often nebulous, borderless, and hard to see. But the thing is that it’s nebulous, borderless, and hard to see in the way that a cloud of matter in outer space is: you may not be able to say what it is, but in passing through it, it tears you apart, and that’s how you know for sure that it’s there. To see writing like that, to live in it and with it, is one of the greatest lessons a writer can experience, in my opinion. And I’m glad to always have this book to return to, in order to remind myself both of what’s possible and what kind of territory I dream of creating. He kept his vision on the spot where he’d seen it among the branches of a rubber tree, putting his hand out for the rifle without altering the direction of his gaze. It moved again. Now he saw that it was some sort of monkey, not much bigger than a Chihuahua dog. … Without really thinking about anything at all, he squeezed the trigger. … Seaman Houston walked over to the monkey and laid the rifle down beside it and lifted the animal up in his two hands, holding its buttocks in one and cradling its head with the other. With fascination, then with revulsion, he realized that the monkey was crying. Its breath came out in sobs, and tears welled out of its eyes when it blinked. It looked here and there, appearing no more interested in him than in anything else it might be seeing. “Hey,” Houston said, but the monkey didn’t seem to hear. Arna Bontemps Hemenway is the author of Elegy on Kinderklavier (Sarabande Books), winner of the 2015 PEN/Hemingway Award. 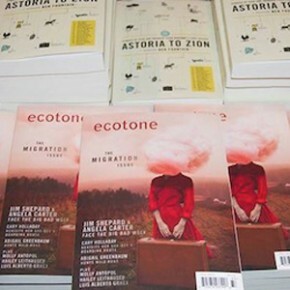 His fiction has appeared in Ecotone, The Best American Short Stories 2015, and elsewhere. He is an assistant professor of creative writing at Baylor University in Texas. Find more on his website.